Until relatively recently the study of children's drawings has reflected a 'top down' approach which takes the pursuit of realistic representation as its goal and a stage theory which has been generalised from the work of Luquet (1927), Piaget (Inhelder & Piaget, 1958), and Kellogg (1970) as its model of development (Matthews, 1992:26, 1999:84). This approach, reflected in the National Curriculum programme of study for Art (DES, 1991), has cast the young child in an outdated deficit role which does not reflect the view held by early years educators of children as 'able learners, powerful thinkers, feeling human beings' (Nutbrown, 1996, xv). Also damaging to some extent, for the understanding of the role of drawing in young children's learning, has been the exchange of the word 'drawing' for 'mark making' in educare settings (Athey, 1990, Nutbrown, 1994). The term, in emphasising the importance of children's earliest marks for writing development, can give the message that pictorial representation is inferior to the more important role that the reading and writing of symbols has been given within the National Curriculum and within society in general. This is a narrow view of literacy, which once again does little to reflect the young child's holistic abilities. These studies have concentrated upon the relationships between children and their 'significant others'. Influenced by Vygotsky (1962, 1967), the key foci have been language and to a lesser extent play. Little is known, however, about the impact upon a child's use of drawing of firstly the different settings of home and pre-school or school, and secondly the roles taken by 'significant' others in 'formal' and 'informal' learning contexts, particularly over any length of time. Drawing is seen to have originated from children's physical action (Matthews, 1994; 1999) and play (Vygotsky, 1995). Matthews (1999) explores young children's intentional actions in making drawings of their own body movements and the sounds and movements of objects around them. He calls these 'action representations'. In common with Athey (1990) he describes development as 'an interaction between what is unfolding in the child and what is available within the environment' (Matthews, 1994). Athey concentrates on drawing as a reflection of children's inner schematic representations, the developing organisational or conceptual systems by which they make sense of diverse aspects of life. 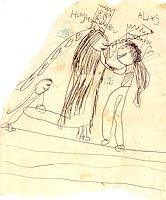 Matthews, however, sees children's drawings 'located within a family of expressive and symbolic actions used fluently by children between 3 and 4 years of age' (1999:49). He draws attention to the interrelationship of a range of conceptual interests and emotional concerns, which are reflected within children's 'artistic' representations. Supported by the work of Trevarthen (1980, 1995) he suggests that 'the basis for the expression of emotion and the representation of objects and events form within an interpersonal arena between caregiver and infant' (1999:17). It is within this interpersonal relationship that the child acquires 'skills in viewing, handling and visually tracking objects, plus the expressive and representational possibilities these might have…' (1999:18). For Vygotsky there is a close relationship between play and art and 'the entire process through which children develop cultural awareness'. Play is seen by Lindqvist to create meaning. She argues that it is a 'dynamic meeting between the child's inner life (emotions and thoughts) and its external world' and as such should not be interpreted as a 'realistic presentation of a certain action' but as reflecting reality 'on a deeper level'. Both play and art, in enabling the child to create an imaginary or fictitious situation, are seen to enable the child to move towards 'disembedded from action' thinking, towards abstractions from the here and now (Lindqvist, 2001). Building upon the work of Wells (1986) and Bruner (1996) the term 'meaning making' is used extensively when considering the child as a learner from a sociocultural perspective. Dyson (1993) sees a symbol, be it a word, picture or dance, existing because of a 'human intention to infuse some tangible form - a sound, a mark, a movement - with meaning and, thereby, to comment on or take action in the social world'. Symbol making is, for Dyson, 'the essence of being human' and drawing, as a symbolic system, is one of the ways humans liberate themselves 'from the here and now'. Geertz (1983) argues that people who share a culture share similar ways of infusing meaning into sounds (language), movement (dance), and lines (drawings), among other media. Children, by using symbols, join with others who share the same 'imaginative universe' or 'worlds of possibility' (Dyson, 1993:23). Dyson illuminates the way drawing is helped by the critical role of talk and gesture to become 'a mediator, a way of giving a graphic voice to an intention' (Dyson, 1993:24). 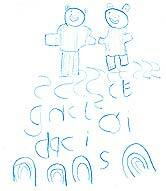 She draws attention to Vygotsky's description of drawing as a kind of 'graphic speech' (Dyson, 1982). This adaptation places emphasis on drawing as an iterative process during which a child may display more than one of the listed features simultaneously, depending on the media, the task and the context. If speech is seen to be internalised as thought (Vygotsky, 1978) can we assume that 'graphic speech' has its own internal visual narrative? Gallas (1994:xv) takes the view that children's personal narratives, formed in an attempt to order and explain the world from all aspects of their experience, 'are often part of the silent language that embodies thinking'. She takes 'an expanded view' of children's narratives, not confining them to the spoken or written word, but including the stories they tell from early childhood 'in dramatic play, in their drawings and paintings, in movement and spontaneous song.' In putting forward her view of the young child as a powerful meaning maker, Gallas draws attention to adults within school settings not enabling young children to make use of their 'enormous number of innate tools for acquiring knowledge' (xv) or their different modes of representation which might be visually, verbally or kinaesthetically based. Because of years spent with adults less flexible in thinking and communication she feels that most children 'lose their natural gifts for narrative expression.' (xvi). There is a lack of recognition by most adults of the power of drawing in serving a narrative function for children by externalising their experiences, thoughts and feelings through visual images. 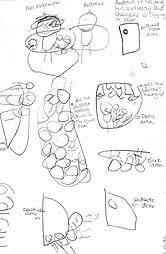 Malchiodi (1998) gives drawing a dual role as a narrative form, enabling children to express their individual stories through a developmentally appropriate form of communication and providing a focus for talking about their drawings. Pahl (1999) uses Kress's thesis to study children's meaning making in nursery education and notes that the objects children made in the nursery settings often have a 'fluid quality'. Children create layers of narrative as they represent and re-represent versions of stories in their play. A shopping basket made from a cereal packet and strips of card for role-play in the nursery might be transformed into a carrycot for a doll when the model was taken home. She argued that children had more opportunities to utilise fluidity in their meaning making at home where objects could be freely transformed from one function to another without the watchful gaze of an adult. She sees these 'lines of enquiry' offering scope for children to explore the gap between 'me' and 'not me' using the models they make as 'transactional objects'. The models children carry from nursery to home offer them opportunities to explore the inner workings of their minds through the outer material representations of their thinking shaped in particular ways by the environments in which they try to record their understanding of the world. Drawing is seen by Kress and Pahl to be one of the many languages which children use to 'talk' about their world in informal settings, both to themselves and to others. Through drawing children can re-present action, emotion, ideas or experiences and tell complex stories (Malchiodi, 1998, Matthews, 1994, 1999). Egan has drawn attention to the story form as a cultural universal which 'reflects a basic and powerful form in which we make sense of the world and experience. '(1989:2) Given the emphasis on a traditional view of literacy and narrative within the statutory English curriculum, it is not surprising that oral storying and story writing have received far more attention within research than storying through drawing. 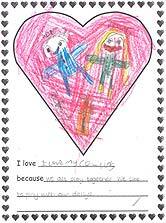 Exploring the young child's use of drawing from a socio-cultural perspective allows the impact upon the young child's drawing behaviours of the views and beliefs of older and more significant others across both home and pre-school settings to be highlighted. It also emphasises how the young child, operating at profound levels both cognitively and emotionally, uses narrative across modes of representation which include drawing. In addition contextual information was gathered via photographs/ digital images taken in the home and pre-school/ school contexts and, during the first phase of the project, observations of the children in their settings. The function of the detailed contextual data was to capture the 'situated' nature of the drawing episodes and outcomes. The following exemplars, drawn from the study, show how individual children use drawings as a narrative form to 'talk' to themselves and to others and by doing so construct new meanings. Each child's drawings reflect versions of meaning making from the socio-cultural context in which they construct their narratives: from TV, videos and signs, from book, magazine and computer based imagery. There is evidence that the cultural assumptions about drawing in home and school contexts affects what the children draw, how they draw and how often they draw. Yet each child demonstrates a unique drawing style and an exploration through line of intensely personal responses to experiences. 'In doing so they participate in the making of their culture' (Kress, 1997) and show themselves to be able and powerful storytellers. At just turned three Luke was the youngest child in our sample in the first phase of the data collection. He lived in an inner city council house with his mother, father and eighteen-month-old brother. Both boys attended a Family Centre for parts of the week. In the Family Centre Luke was preoccupied with cutting paper systematically into smaller and smaller strips. This was usually a solitary activity, completed in silence and with total concentration. The pattern of action was repeated in the dough. He was very dependent on the reassurance of his key worker and he often reassured himself of her whereabouts. The only self-chosen drawing activity recorded by the Centre staff during this phase of the research was 'Dr Jekyll When he Turned into a Nasty Monster' (Figure 3). LUKE But you know what? One day, one night, my Dad told me this story and do you know what he said? This little boy went on holiday with his Uncle Nick and do you know what? One day the little boy looked out of the window at the field and they were playing football and he went to tell his Granddad and he said those are ghosts. And then the next night he stayed up really late and looked out of the window again and they were playing football again and guess what they were playing with? A head! Somebody's head! SCOTT I've seen it real me. I've seen someone kicking someone, a dead people. LUKE Oh, don't tell me about it will you. Oh please don't. I'm not going to listen. SCOTT It's not scary; it's not scary. SCOTT Once I heard this boy scream and there were monsters out of the windows, zombies. LUKE There's no such thing as zombies. RESEARCHER A swinging light bulb. Where've you seen one of these? LUKE Nowhere. I just decided to do one. Can you see it on the bit of string? Two drawings, one from home and the other from school drawn the following day, both show bread-making machines. (Figures 5 and 6) His teacher was at a loss in trying to explain what had stimulated Luke to make this drawing at school, but characteristically tried to ascribe it to school influences: 'It was harvest time and we'd read The Little Red Hen, and one of the older classes had used that story as the basis of their class assembly. Now that could just be me making a connection….' It was Luke's father who finally made the connection: 'I think his Nan has got a bread making machine.' What is clear is that Luke was struggling to make sense of the mysterious and complex processes by which a machine delivered a perfect bloomer loaf for his Nan through representing it in his drawings. Lianne's mother was a classroom assistant in her primary school so she had the advantage of a parent who could bridge the gap between the cultures of home and school. She had a seven-year-old brother. The house was untidy, slightly chaotic, warm and accepting. The children were actively encouraged to role-play all around the house. Storying was everywhere - through toys, puppies, videos, TV programmes and books. Her school start was a happy experience. When we first encountered Lianne she had a Reception class teacher who encouraged the children to learn through practical, play-based activities. 'Bear in the stock cupboard' (Figure 7) was created in response to a narrative Miss K. created for the children about a new 'pupil', a bear, too shy to come out of the stock cupboard. Lianne wrote the message, which she read back as PLEASE COME OUT, to entice the bear out to join the children. The stock cupboard bear is on the left and she explained that the one on the right was her own bear from home making friends with the new pupil. The rainbow shapes at the bottom of the picture are bear caves to make him feel happy. Lianne posted this message under the stock cupboard door. To her delight, via Miss K., the bear replied asking if he could meet her bear. Her mother was of course complicit in the story and the shy bear was lovingly taken home for the weekend. A confident bear came back on Monday with a long tale about the adventures that he had shared with his friend at Lianne's house. This is an example of a rare occurrence in our data where significant adults in a child's life operated in two cultural contexts with the same commitment to interest in the child's multi-modal representations (Kress 1997). Lianne was shocked by the transition from reception class to the formal requirements of Year One and the first 'run through' of the Literacy Hour. Her loss of role-play activity led her to constantly talk or lose attention and 'live in her mind'. 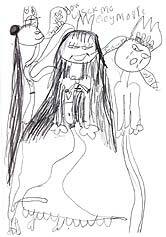 Although at school her drawing was limited to small pictures with adult directed writing, at home she continued her school based role-play. Her ongoing narrative put her in charge and gave her some control. Figure 8 shows one of the many 'mark lists', which supported her activity. By the third year of the project had Lianne 'got used to' more formal schooling. The dual preoccupations in her home drawings were with practising the mysterious symbolic systems embedded in the world of school knowledge and exploring the complexities of human relationships. Lianne is using drawing to integrate her inner experiences and perceptions, link her experience of the outside world with her inner self and to help her discover and affirm her relationships (Malchiodi, 1998). 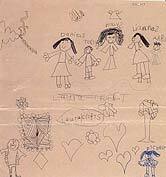 Amongst a string of drawings, half message and half narrative, featuring her friends, her mum and her dad, this is an example of the genre exploring love and friendship (Figure 9). Jake's home life was characterised by encouragement from his literacy support teacher mother and engineer father to explore ideas and objects with equal enthusiasm and to relish physical freedom to play. He had a sister three years older than him. His mother said: 'People always comment on the fact that my children are verbally expressive … they can paint with words. My husband and I are articulate and we spend time talking with the children, though not necessarily playing with them.' Jake and his sister played out long and complex imaginary adventures about journeys or stories stimulated from books or their own experiences. They were discouraged from watching 'too much' television. As we tracked Jake's progress over the three years he sustained a passionate interest in all fast moving things. At just four he drew Superjets (Figure 11), at five the frenzy of the Roller Coaster that his sister and Dad 'enjoyed' (but which he was too young to go on!) (Figure 12) and at six a Combine Harvester (Figure 13). By six Jake was competent at representing objects 'realistically'; but his interest in drawing representationally was always minimal and we suspect his mother, knowing that the researcher was due to collect the data, had a hand in the picture of the combine harvester. Figure 14 shows the magic moment recorded by his parents when, during a game of Pictionary at the age of five, he suddenly realised he could make things look like things. His growing confidence, and his desire to 'play to the audience' with his new found skills, is shown in the house drawing. The family audience had reacted with delight and laughter to the udders on his drawing of a cow. He capitalised on the attention by adding udders to his next drawing - of a house. Sadly, with little feedback from school staff from his more abstract narratives of movement and time shifts he drew less and less. A bright child, he quickly adapted to symbolic codes of schooling, writing and mathematical representations He was supported by his mother in gaining 'school' competencies. She quite literally coached him at home to fluency in these modes in order to ensure that he could have some 'choosing' time. He was then able to indulge his passion for 3D representations. She understood that this lively Summer born boy child would lose his positive disposition to learn in the thralls of too many seat based practice tasks in basic skills. Holly's home life was dominated by a succession of new babies, strong involvement with a local church community and regular Sunday visits with a large extended family to her Nana who always provided drawing materials to keep the children occupied. The children were rarely allowed to watch television. 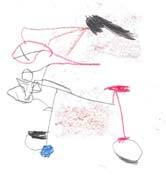 At aged four, Holly's home drawings, done quickly and confidently, feature two aspects of relationships - spatial relationships of significant objects and spaces in her life and the human relationships of significant people in her life. This contrasts with Luke's preoccupation with scary things, Lianne's with the world of symbolic representations through play and Jake's with how things work and moving or changing objects. At four Holly recalled accurately the salient features of the world she observed and interpreted in her drawings. Her recurrent drawings of church (Figure 15) show the details of Darren playing the guitar, spaces where adults and children gathered for worship and talk, and the entrances and exits to significant rooms. Her accurate drawing of the nursery classroom shows its salient features for Holly (Figure 16)- the construction area, quiet room, gluing area, domestic play area, Andrew beside Mrs Wilkinson having his birthday song and again strategically the escape routes, the doors. The domestic play area would have drawn Holly's attention particularly, because she played out narratives at home endlessly with a large collection of dolls, in particular Christopher and Annabelle, to inure herself against the chaotic demands of three younger siblings. By the second year of data collection Holly's narratives had shifted to 'girlie' interests under the influence of her older cousins and the older girls she courted in the playground. Friendships and family were still of overwhelming importance to Holly. She told us that she had decided to be a singer when she grew up. Holly continued to pursue her personal agenda in drawings done at school. Figure 17 shows 'I Love my Cousins' and Figure 18 'Here are my friends'. 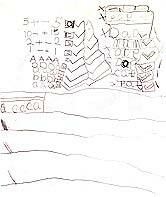 However, by the third year of the project there was little evidence of her drawing at school. Her teacher dismissed her drawings as rushed and rather messy and she had learned that her style of narrative drawing simply did not 'fit' school templates. At home Holly continued to produce a prodigious number of drawings. 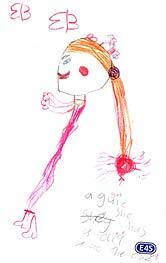 By the third year of the project, when Holly was six, the gendered nature of her drawings was well established. She explored images of hearts, princesses, mermaids, marriages and fashion - in particular exotic hairstyles. Figure 19 shows a side view of a girl so that she can explore the detail of her elaborate ponytail and fixtures. Figure 20 shows her version of her mum and dad getting married. She was influenced by fairy tale formats and combined speech bubbles with images to represent critical moments recalled from the stories - again usually moments imbued with strong emotional content. Figure 21 represents a moment in the story of 'The Little Mermaid'. Evidence from the four case studies reaffirms the role of drawing in young children's learning about the world around them and their coming to terms with their own personal role/identities within the cultures in which they are growing up. Children use drawing both as a way of telling others what it is that matters to them, and as a way of exploring new ideas, concepts and emotions for themselves. As Gallas (1994) argues, the narratives they create in drawings are paralleled by their oral storying and role-play. Children move fluently from one mode of representation to another, often using play as the vehicle for their explorations of how to represent and re-represent what they know. For them there is no separation of the body and mind or of the emotions and intellect (Kress 1997). The project also generated evidence of the importance of the cultural context in determining what form the children's drawn narratives took (Dyson 1982). Each child retained a highly personal drawing style throughout the three years, but each was strongly influenced by the images surrounding them. At home these images were from greeting cards, family games, television or video programmes, photographs, magazines, books and toys. Older brothers or sisters or members of extended families provided models of meaning making for the young children. As the children became more aware of their own identity as male or female, the gendered nature of their drawings became more apparent. 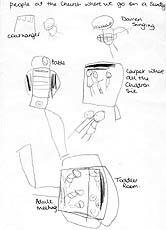 Many of the parents in the project actively encouraged children to use a wide range of drawing genres. In all the homes, which were representative of contrasting socio-economic communities, felt tip pens, crayons, pencils and paper were made available for the children. Within the cultural contexts of pre-schools and schools the messages surrounding the children were that symbolic systems of print and mathematics were what counted for the adults. Drawing was perceived by the practitioners in formal learning settings as a vehicle for reinforcing conceptual understanding, as a way of holding children on low level seat based occupational tasks, or as an opportunity to move pupils towards the goal of 'making things look like things' (Anning 1999). 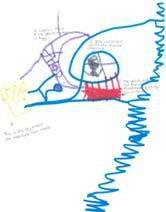 Story telling through drawings was not written into teachers' planned literacy activities. Even at pre-schools it was rare to find teachers who consciously planned art activities in which children might pursue their personal agenda in drawings. At Key Stage One these opportunities were limited to 'wet playtimes' (Anning and Ring 1994). Yet the power of drawing for constructing and representing narratives was impressive amongst the seven ordinary young English children. It seems sad that we observed it declining through their first years at school. Anning, A. (1999) 'Learning to draw and drawing to learn', Journal of Art and Design Education, Vol 18, No 2, pp 163-172. Anning, A. and Ring, K. (2004) Making Sense of Children's Drawings. Maidenhead: OUP/ McGraw-Hill Education. Athey, C. (1990) Extending Thought in Young Children: A Parent-Teacher Partnership London: Paul Chapman. Brittain, W.L. (1979) Creativity, Art, and the Young Child. New York: Macmillan. Egan, K. (1989) Teaching as Story Telling: An alternative approach to teaching and curriculum in the elementary school Chicago: University of Chicago Press. Gallas, K. (1994) The Languages of Learning: How children talk, write, dance, draw, and sing their understanding of the world New York: Teachers College Press. Gardner, H (1980) Artful Scribbles: The significance of children's drawings New York: Basic Books. Geertz, C. (1983) Local Knowledge New York: Basic Books. Golumb (1974) Young Children's Sculpture and Drawing: A Study in Representational Development, Cambridge: Harvard University Press. Golumb (1988) 'Symbolic inventions and transformations in child art. In K.Egan & D. Nadaner (eds.) Imagination and Education (pp. 222-236) New York: Teachers College Press. Lindqvist, G. (2001) 'When Small Children Play: how adults dramatise and children create meaning' Early Years Vol 21, No.1. pp 7-14. Matthews, J. (1992) 'The genesis of aesthetic sensibility' in Thistlewood, D. (ed.) 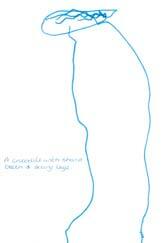 Drawing, Research and Development, NSEAD and Longman, pp. 26-39. Nutbrown, C. (1994) Threads of Thinking: Young children learning and the role of early education London: Paul Chapman. Trevarthen, C. (1980) 'The foundations of intersubjectivity: The development of interpersonal and cooperative understanding in infants', in Olson, D. (ed.) The Social Foundations of Language and Thought: Essays in Honour of J.S.Bruner, New York: W.W. Norton, pp. 316-42. Trevarthen, C. (1995) 'The child's need to learn a culture' Children and Society 9(1). Vygotsky L.S. (1967) 'Play and its role in the mental development of the child' Soviet Psychology 5(3), 6-18. Wertsch, J.V. (1985) Culture, Communication and Cognition: Vygotskian Perspectives Cambridge: Cambridge University Press. Wolf, D. and Perry, M.D. (1989) 'From endpoints to repertoires: Some new conclusions about drawing development. In Gardner, H. and Perkins, D. (eds.) Art, mind and education: Research from Project Zero (pp. 17-34) Urbana and Chicago: University of Illinois Press.